Fellaini, who was pushed up front following Falcao’s removal, then poked in from close range after a brave save from Stuckmann. And then Rooney ended his seven-and-a-half week wait for a goal when he tucked away a penalty after being brought down in the box on a United break. The display against League One opposition will have done little to silence Van Gaal’s critics, but the Dutchman will not care. His team are now one step closer to ending the first year of his stewardship with a trophy – one that United have not won in 11 years. Just a few days after intimating that Rooney would continue playing in midfield, Van Gaal took everyone by surprise by deploying his captain up front alongside Falcao. Rooney looked determined to make an impression by making darting runs behind the North End back four. Angel di Maria sensed as much, but an early attempt to play the skipper in failed as his pass was too heavy. A brief moment of panic occurred when Daley Blind slipped on to his backside when shepherding a ball across the back four, but other than that United looked settled. Joe Garner went down in the box following a nudge by Chris Smalling, but referee Phil Dowd waved play on. Di Maria looked the most likely source of inspiration for United. The home fans held their breath as the B£59.7million man curled a free-kick up and over the wall but, much to their relief, the attempt flew just wide. John Welsh gave the Argentinian a reminder he was at a League One ground when he put in a crunching tackle to dispossess the 27-year-old. Welsh, a Liverpool fan who came through the Academy at Anfield, then dived in to deny Rooney with a crucial block after some good work down the left by Luke Shaw. United’s tempo was much better than it had been in recent weeks and they moved from defence to attack quickly. Di Maria continued to dazzle, beating three Preston players with a run from deep. But more often than not, the final ball from United was poor. Di Maria’s diagonal pass to Falcao was too heavy, Blind was guilty of the same thing and Rooney inexplicably fired a 40-yard pass straight out of play. Luckily for United, Preston offered little going forward either. Their main chances before the break came when Garner headed over and Paul Gallagher fired a low shot at David de Gea. Two minutes after the restart, the Preston fans got the dream goal they had wished for. Laird ran on to Garner’s incisive pass and fired an early shot that squeezed past De Gea via the toe of Antonio Valencia. Laird was booked for his frenzied celebration and a pyrotechnic went off among the home fans. Tom Clarke came close to raising the Deepdale roof moments later, but he could not get a clean connection on a close-range volley. Van Gaal replaced Falcao with Young, who moved out to the left wing. United instantly looked more threatening with two wingers on the pitch and Young provided the assist for the equaliser. The former Aston Villa man found Herrera, who fired a powerful shot past Stuckmann and in off the post. 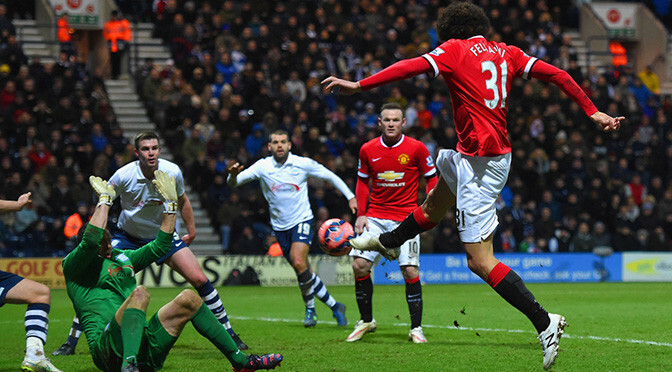 Preston desperately tried to cling on for a money-spinning replay, but Fellaini struck to put the visitors ahead for the first time. Valencia swung in a deep cross to find Fellaini. The Belgian’s first effort was blocked by Stuckmann but he stabbed the ball in at the second attempt. And the result was put beyond doubt when Rooney raced on to a through ball and was brought down by Stuckmann. The England captain got to his feet and banged the ball past the North End goalkeeper to seal United’s progression to the last eight. Preston hit three goals in 10 second-half minutes to dispose of cup kings Sheffield United 3-1 and set up a mouth-watering FA Cup fifth-round home clash with Manchester United. It looked as if the Blades, who were beaten in the Capital One Cup semi-final by Tottenham last week , would continue their love affair with the cup competitions as they led through Jamie Murphy’s first-half opener. But they were second best throughout and Preston responded in style after the break as Paul Gallagher netted either side of Paul Huntington’s header to arrange the meeting with Louis van Gaal’s side, who saw off Cambridge 3-0 in their replay on Tuesday night. It was thoroughly deserved for the visitors, who bossed matters from the off and should have been in front after 12 minutes when a defensive lapse from Chris Basham sent Kevin Davies clear but, with time and space, the veteran striker could only hit the post. There were further chances for Simon Grayson’s men and home goalkeeper Mark Howard made a hat-trick of saves, the best a superb low stop to keep out Tom Clarke’s back-post header. And it was against the run of play when the hosts, who reached the last four of this competition last season, stole into a 38th-minute lead as Murphy cut inside and his low shot went through keeper Thorsten Stuckmann’s grasp. It was an open start to the second half, with both sides threatening, but North End wrapped up the tie with a 10-minute three-goal salvo. Gallagher’s moment of brilliance brought the sides level after 63 minutes as the on-loan Leicester man whipped a stunning 18-yard free-kick into the top corner, and Huntington’s header from Scott Laird’s corner six minutes later put the visitors ahead. The game was made safe when Gallagher netted from the spot following Jay McEveley’s foul on Chris Humphrey, and United had no response as their impressive cup exploits ended for another season. Preston came from behind to draw with bottom club Yeovil Town, but missed the chance to move third in League One. Gozie Ugwu netted his second goal in as many games to put the Glovers ahead just before half-time, much to the delight of their 73 travelling fans. 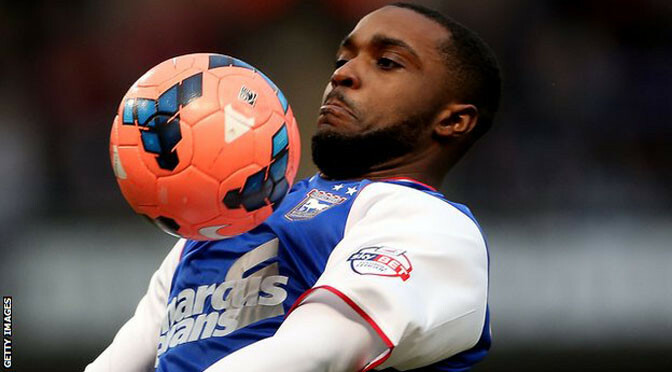 But the hosts drew level when substitute Sylvan Ebanks-Blake rounded goalkeeper Jed Steer. Preston are now without a league win since Boxing Day and are seven points off the automatic promotion spots. Yeovil, meanwhile, remain at the foot of the table but are only two points from safety.